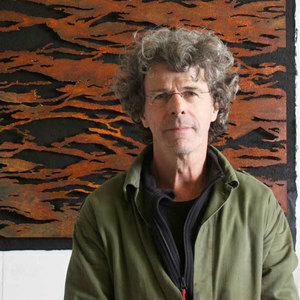 Bob Takes is an artist based in Antwerp who is known for his steel sculptures. He studied both graphic design and audiovisual design at the Gerrit Rietveld Academy in Amsterdam in the 1980's, and although his practice can be understood as diverse his background in graphic design is still clearly recognizable. Through his autonomous work, Takes balances playfully on the border of the abstract and the figurative. Takes has shown his work previously in both established art space and gallery environments, as well as large-scale public spaces. When creating his works, Takes commonly combines the digital with the manual . A recurring aspect in his work are ‘Seascapes'. Through these visualizations, Takes translates the dynamics of the sea into steel sculptures.